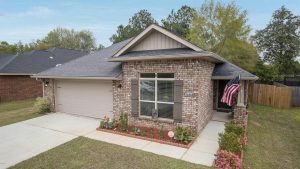 New Listing in Canal Crossing! Warm and inviting home located in Canal Crossing! From the time you walk in you’ll feel comfortable and want to stay. The eat in kitchen is just the right size for your family meals and you will love the natural sunlight from the large kitchen window. You’ll appreciate the covered porch and extended patio for barbecues, cookouts or just enjoying your large backyard. Features include: smart home controls, adequate living space, Solid surface flooring and double garage. Agent: What made you buy this house? Seller: The bright warmness that hits you the moment you walk into the living room and the open living room to the kitchen floor plan. The house has always felt bigger than it is with its semi-open floor plan and tall ceilings. We love windows and natural light. The fact nobody could ever build in front of my house and the neighbor behind me owns about 5 acres I never felt like I was going to be boxed in here. The tree in my backyard reminded me of being where I grew up and needless to say I grew up in the woods. A woodsy feeling in a semi-city setting outside of Gulfport city limits. Agent: What do you love most? Seller: The thing we love most is the comfortable warm feeling you get while in this house. It is the definition of a comfy home to us and what a home should be. DR Horton really did a great job with this home. Agent: What will you miss most? Seller: We will miss everything from the warmth of the light to the semi-private barbecues in our little piece of the woods “our back yard”. This place will always hold a very special place in our hearts. It was our first everything from home to life changes we will never forget. It is a little piece of our heart we will always carry with us. We will miss it dearly. The MS Gulf Coast is just an amazing place to live! Gulfport is a great town that offers so much for everyone at every stage in their life!